Note: this is almost entirely a thought exercise designed to be interesting or fun depending on your tolerance for these things. While the math is done correctly, obviously there are numerous basketball/roster reasons why this might not be a good idea. Seriously, this is meant to spur thought and discussion, not serve as an endorsement of the tactics discussed. Joel Embiid is very good. Based on data from Cleaning The Glass($), Table 1 should generally show the extent of his impact. In some magical land where fatigue doesn’t exist, Joel would ideally play 48 minutes a game and the Sixers would cruise to 60 wins. However, this is not that land and there are about 14 minutes per game where Joel is not on the court. As seen in Table 1, the Sixers are getting murdered when he is not on the court, although of course this includes garbage time and other mostly bench lineups. My question is, what would be one way to minimize the impact of the time Joel is on the bench? In order to illustrate the idea at the heart of this little experiment we need to first do a few million simulations to go super extreme. Using 2015-2016 team data comparing the 73 win Golden State Warriors juggernaut to the 10 win Philadelphia Processers juggernaut(ish) lets consider two scenarios. The first is where they play each other 100 times, but each team only gets one possession. The second is where they play each other 100 times but each team gets 1,000,000 possessions. Using true shooting data, we can simulate what the scores would be for each set of 100 games and how many the Processers would have won. Figure 1 shows the margin of each simulated game. 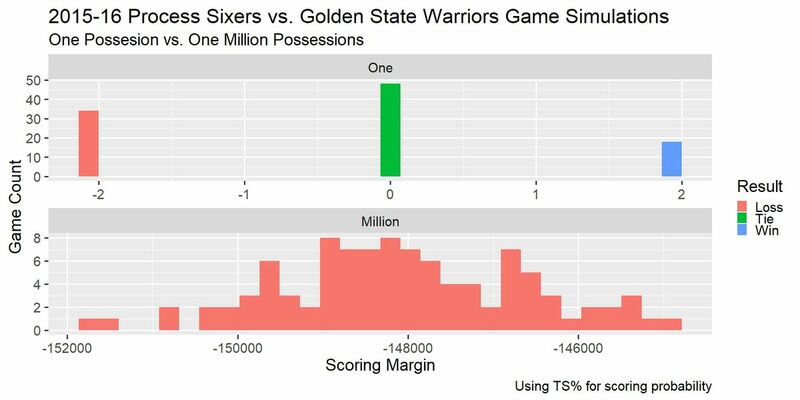 In the the games where both teams got one possession, the Sixers won 22/100 games, but won 0/100 games in the million possession scenario. Essentially, the fewer possessions, the less time for the superior team to win. The more trials where you flip a TS% based coin (possessions) the more likely it is that the results will move towards their respective means. The same can be said for a seven game playoff series on the whole – its possible for the underdog to steal a game (see 2001 finals) but winning 4/7 is pretty unlikely. Again, slightly glossing over some details, but you get the point. (This is one of the reasons playing triple option teams in football can be tricky). In the 2018-19 season, teams across the NBA average 14.3 seconds per possession. Using a little math (and eye test) and some idea that we want to increase variability given that in the next step we are artificially changing how teams might play, we get a standard deviation of about 3 seconds (will play with this in later steps as well). So, if we assume that both the Sixers and their opponent play stock average time per possession for the 14 minutes (840 seconds) Joel is off the court per game, it ends up with both teams at 29 possessions. If we refer back to the Table 1, the Sixers score 1.074 points per possession (ppp) and allow 1.143 ppp with Joel off, for a total of 1.074 – 1.143 = -0.069 points per pair of possessions. Therefore, with our average of 29 possessions per team with Joel off the court, the Sixers are approximately outscored by 29 * -0.069 = 2.001 points in total. This might not seem like a lot, but the differential in net rating (which this more or less is) is in the 95th percentile across the league. We saw earlier in our simulation that the underdog (Process Sixers) wins more often in fewer possession games in longer games. My possibly bonkers idea (which does not take into account literally anything else besides raw numbers so don’t tell me in the comments I didn’t take into account Ben’s fast breaking genius) is that the Sixers should play those 14 minutes when Joel is off the court literally as slowly as possible by the rules, eschewing offensive efficiency to bleed clock and reduce the number of -0.069 possession pairs. They should play like the underdog (reduce number of possessions), since they pretty much are at that point. I don’t mean taking your time to get a quality shot, I mean hucking up a three at 23.9 on the shot clock while everyone sprints back on defense. Let’s set some ground rules for the rest of the piece. All shots by the Sixers will be threes, and they will all be reasonably poor quality looks given the lack of “real” offense. We will set the shooting as a normal distribution with mean of 30% and standard deviation of 2.5% (feel free to argue this point). No opponent defensive data will be used. All possessions faced by the Sixers will be half court possessions – there is no attempt to get rebounds, just literally sprinting back before or at the release of the shot. Opponent shots will be offensive rebounded at a rate of 25%, approximately the NBA average. Opponents will run their normal half court offense with an increase in efficiency of 8.8% corresponding to the decrease in Sixers defensive efficiency with Joel off the court. Opponent specific half court TS% data will be used. The minimum time for a half court possession is set at five seconds. Each game will have the total number of minutes Joel was off the court simulated using the above criteria, with the opponent starting with the ball at the beginning of that period. For example, if Joel was off the court for a total of 16 minutes, a full continuous 16 minute chunk will be simulated to avoid killing me with work. Following the simulation the +/- of the actual Joel off game data will be compared to the simulated Joel off +/- data. In order to prevent uploading 40 graphs, here’s just a look at games against Phoenix in Figure 2. The vertical line is the actual +/- for when Joel is on the bench. The distribution is the density of 10 trials of simulating the time he was off the floor. 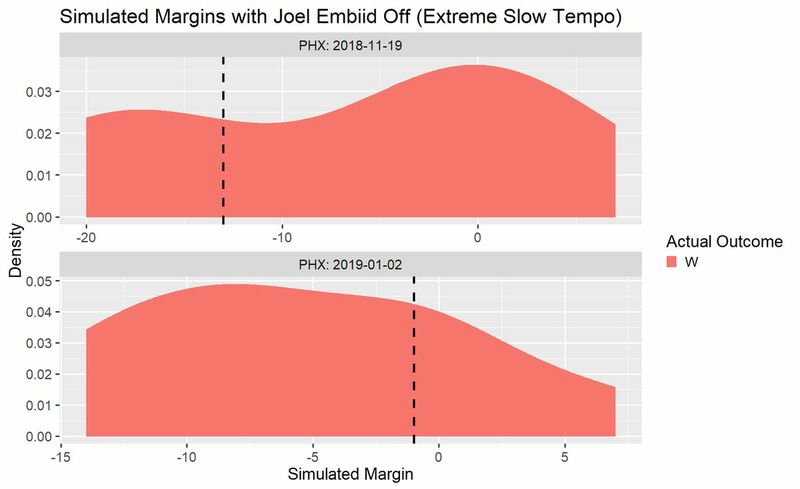 In the 11/19/2018 game, the average simulated outcome is better than the actual outcome of the Joel off court time (-6.6 vs -13). The 1/2/2019 game’s actual margin of -1 was better than the average simulated outcome of -5.3. Table 2 below presents a summary of the data by team. The first six columns should more or less be self explanatory. The “Better Than Actual” column is the percentage of trials that resulted in a better scoring margin than the actual Joel off court +/-. The last two columns show the percentage of trials that resulted in the outcome (win or loss) flipping to the other. When you simulate the season based on the above table, the Sixers would average about 5.33 extra wins and 0.75 extra losses, for an average total of +4.58 wins. (The probability of being on the receiving end of some hilarious blow outs was not calculated but some of the tails of the distributions are pretty funny). The results are certainly something. It is extremely hard to draw meaningful conclusions from an exercise this divorced from how basketball is actually played (does not account for fouls, turnovers, etc. ), but I feel like there might be a kernel of truth. Should teams have multiple highly distinct styles of play that they use based on personnel? Obviously you don’t give Mike Muscala or Jonah Bolden the same number of post touches as Embiid when they’re playing the five, so this does happen to an extent (also Ben at point center is certainly a different style). I feel like a G-League experiment with radically different play styles based on lineups might be kind of cool. Could be an interesting way to leverage all the strengths of the 15 person roster. Alternatively, I’m an idiot. Do you like experimental/weird pieces like this? Previous Post The Flyers gave up 5 to Washington and Ovechkin didn’t score. How was your day?